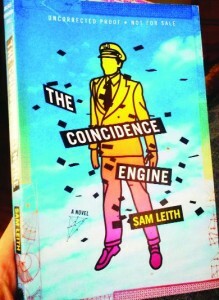 Somewhere, the spirit of Douglas Adams is crying foul over Sam Leith’s new novel The Coincidence Engine. Lifting from the Hitchhiker books Adams’ infinite improbability drive is a far more venial sin than abandoning the promising screwball comedy of the novel’s first half for a much deeper, darker, and incongruous exploration of the characters that populate this madcap tale. 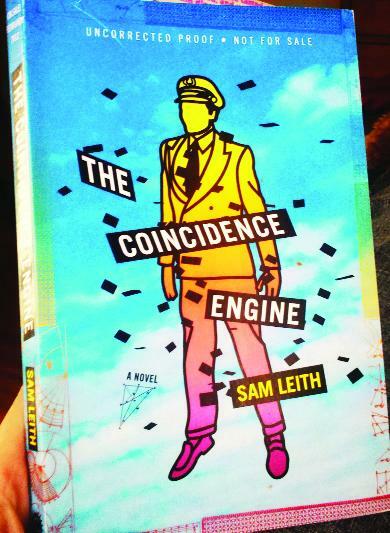 The coincidence engine itself, a device that does “end of the bell curve” things to chance and probability, may or may not exist, but it is the object of intense interest to a couple of sinister organizations and the people they employ to retrieve it. After a 737 spontaneously assembles itself from nothing in ruralAlabamain an attitude of a crash, both the DEI (Directorate of the Extremely Improbable) and MIC Industrial Futures, a shadowy multinational arms company, understand that the brainchild of a mysterious mathematician Nicholas Banacharski may actually be real, and they are prepared to go to extraordinary lengths to find it. Alex Smart, a young British post-grad trying to figure out what do with his degree and whether or not he should propose to his American girlfriend Carey, knows nothing about any of this, nor is he even aware that he is both the prime suspect in the theft of the coincidence engine and the subject of a manhunt that at times resembles a cross between a Looney Tunes short and a deleted scene for It’s a Mad Mad Mad Mad World. While MIC operatives Sherman and Davidoff, a pair of somewhat dim but quite dangerous ex-soldiers keep missing Alex by literal inches, DEI agent Bree, a recovering alcoholic and mother of an estranged daughter, travels a parallel path with her creepy partner Jones, a man who suffers from a psychosis, which manifests for him in a complete inability to imagine or perceive of anything beyond physical reality. Hovering over all of this in her offices deep beneath New York City is the mysterious Red Queen, director of the DEI. It’s a wonderful premise, one that promises full outlet for an author who wants to set loose his wildest flights of fancy. And for the roughly the first half of the text Leith faithfully delivers the farcical romp his story promises. Somewhere, however, he gets turned round. Bree’s tragic history is foregrounded and drains much of the fun from the story. Jones’ condition causes serious consequences. Alex’s journey evolves into a meditation on a life, specifically his own but by extension anyone’s, at a crossroads. Great comedy is always no more than an inch or two away from tragedy, and very often the tipping point is as much a matter of tone as it is of plot. There was no way to make light of Bree and her daughter, no way to laugh at Sherman’s devotion to his colleague Davidoff, and it would have been a betrayal to portray Carey and Alex’s relationship with anything less than the respect and tenderness with which Leith conceives it. These explorations are executed flawlessly, and it is by means of that very skill that Leith performs his bait and switch. The laughs dry up in the second half of the book, the text gets heavy, and a thoughtful, mature novel materializes where once there had been a rollicking comic funfest. Strange coincidences still drive the plot, but these are secondary to the inner lives of the characters. The closer Alex gets to Carey, the closer the DEI and MIC get to him, the less the coincidence engine seems to matter. Other writers have gone here before (Carl Hiassen, Tim Dorsey), but the sympathy they allow themselves to feel for their characters is delivered in quick blasts that never invade the overall lighthearted atmosphere. Leithis doing two very different things very well in The Coincidence Engine. What he does less well is sew them smoothly together, and the result is a funny, highly inventive but uneven novel.